MP Customs was started in May 2008 as a partnership by Jonathan Sloman and Adam Sillifant with the start off a motor vehicle garage. In July 2010 the business changed into a limited company and in October 2011 the business expanded with the opening off the body shop and the employment off a paint technician with 30 years of experience. The company carry's on growing from strength to strength and continues to give outstanding services both with the garage and body shop. MP customs was established 4 years ago and has quickly become one of North Cornwall's up and coming vehicle repair centres with a rapidly growing portfolio of satisfied customers. By providing our clients with a high standard of care and speaking to our customers in plain English we have gained a reputation for integrity, quality, reliability and a friendly local service. 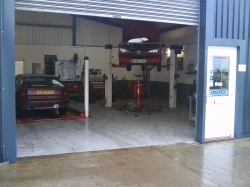 Located a stones throw from Bude offering a multitude of services from a simple straightforward service to a full engine rebuild. We are also able to carry out servicing to industry standards meaning that we can carry out routine servicing on your brand new vehicle to the manufacturers standard using genuine parts therefore maintaining your manufacturer's warranty. Our modern facility is equipped with the latest diagnostics equipment, Laser wheel alignment technology and we are able to work on any vehicle from an Alfa Romeo to a Volvo. Introducing our new body shop and accident repair business. MP customs are pleased to announce that in addition to our servicing and repair business we have added a cutting edge body shop to our brand. Utilising the latest in paint technology and mixing technology we are able to undertake anything from a simple body repair to a full restoration project. We have a brand new computerised paint mixing system and all of our work is carried out in a climate controlled booth to ensure consistently good results. Our head painter and bodywork technician has over 30 years' experience in his field and has spent the majority of his career working at a prestigious London Ferrari dealership preparing and painting exotic cars for the connoisseurs so' you can be assured the quality of work will be of the highest possible calibre and meet your exacting expectations. So whether you are looking for some help with your restoration project or simply want a panel repaired why not give us a call or drop in for a no nonsense quote?